Neo4j has just released a new version of APOC, everyone's favorite stored procedure library for Neo4j 3.x. Come find out what's new and what it means for you! If you haven’t seen the first part of this series, make sure to check out the first article to get an introduction to Neo4j’s user defined procedures and check out our APOC procedure library. First of all, I want to announce that we just released APOC version 3.0.4.1. You might notice the new versioning scheme which became necessary with SPI changes in Neo4j 3.0.4 which caused earlier versions of APOC to break. That’s why we decided to release APOC versions that are tied to the Neo4j version from which they are meant to work. The last number is an ever increasing APOC build number, starting with 1. So if you are using Neo4j 3.0.4 please upgrade to the new version, which is available as usual from http://github.com/neo4j-contrib/neo4j-apoc-procedures/releases. Random graph generators (by Michal Bachman from GraphAware). PageRank implementation that supports pulling the subgraph to run on WITH Cypher statements apoc.algo.pageRankCypher (by Atul Jangra from RightRelevance). Basic weakly connected components implementation (by Tom Michiels and Sascha Peukert). Support for leading wildcards “*foo” in apoc.index.search (by Stefan Armbruster). apoc.schema.properties.distinct provides distinct values of indexed properties using the index (by Max de Marzi). Timeboxed execution of Cypher statements (by Stefan Armbruster). Linking of a collection of nodes with apoc.nodes.link in a chain. apoc.util.sleep e.g., for testing (by Stefan Armbruster). Build switched to gradle, including release (by Stefan Armbruster). We got also a number of documentation updates by active contributors like Dana, Chris, Kevin, and Viksit. Thanks so much to everyone for contributing to APOC. We’re now at 227 procedures and counting! If you missed it, you can also see what was included in the previous release: APOC 1.1.0. But now back to demonstrating the main topics for this blog post. Besides the flexibility of the graph data model, for me, personally, the ability to enrich your existing graph by relating data from other data sources is a key advantage of using a graph database. And Neo4j data import has been a very enjoyable past time of mine, which you know if you followed my activities in the last six years. With APOC, I got the ability to pull data import capabilities directly into Cypher so that a procedure can act as a data source providing a stream of values (e.g., rows). Those are then consumed by your regular Cypher statement to create, update and connect nodes and relationships in whichever way you want. Because it is so close to my heart, I first started with apoc.load.json. Then, I couldn’t stop anymore and added support for XML, CSV, GraphML, and a lot of databases (including relational and Cassandra via JDBC, Elasticsearch, MongoDB and CouchBase (upcoming)). All of these procedures are used in a similar manner. You provide some kind of URL or connection information and then optionally queries/statements to retrieve data in rows. Those rows are usually maps that map columns or fields to values, depending on the data source these maps can also be deeply nested documents. Those can be processed easily with Cypher. The map and collection lookups, functions, expressions and predicates help a lot with handling nested structures. Let’s look at apoc.load.json. It takes a URL and optionally some configuration and returns the resulting JSON as one single map value, or if the source is an array of objects, then as a stream of maps. The mentioned docs and previous blog posts show how to use it for loading data from Stack Overflow or Twitter search. (You have to pass in your Twitter bearer token or credentials). Here I want to demonstrate how you could use it to load a graph from http://onodo.org, a graph visualization platform for journalists and other researchers that want to use the power of the graph to draw insights from the connections in their data. 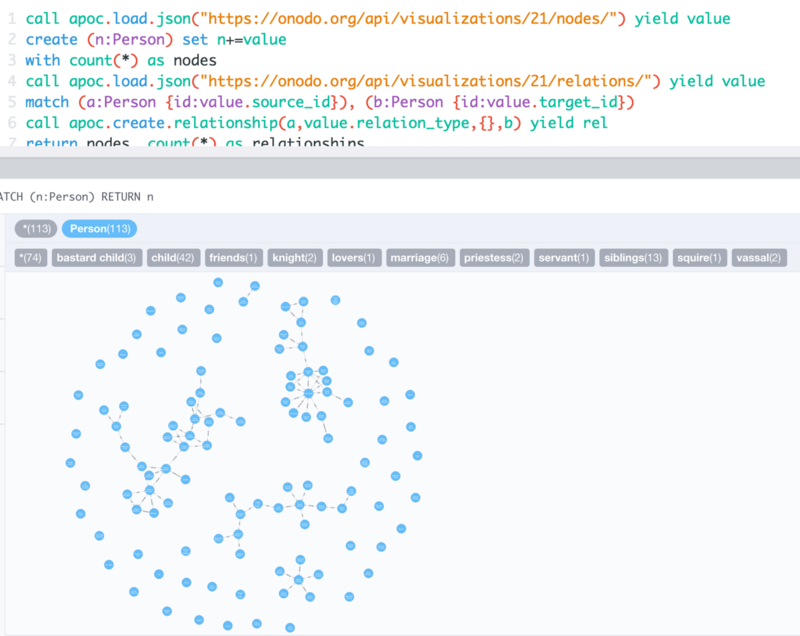 I came across that tweet this week, and while checking out their really neat graph editing and visualization UI, I saw that both nodes and relationships for each publicly shared visualization are available as JSON. To load the mentioned Game of Thrones graph, I just had to grab the URLs for nodes and relationships, have a quick look at the JSON structures and re-create the graph in Neo4j. Note that for creating dynamic relationship-types from the input data I use apoc.create.relationship. The procedure for loading XML works similarly, only that I had to convert the XML into a nested map structure to be returned. While apoc.load.xml maintains the order of the original XML, apoc.load.xmlSimple aggregates child elements into entries with the element name as a key and all the children as a value or collection value. You will find more examples in the documentation. In past articles and documentation, we demonstrated how to use apoc.load.jdbc with JDBC drivers, the powerhorse of Java Database Connectivity to connect and retrieve data from relational databases. The usage of apoc.load.jdbc mostly reduces to dropping the database vendor’s jdbc-jar file into the $NEO4J_HOME/plugins directory and providing a jdbc-url to the procedure. Then you can declare either a table name or full statement that determines which and how much data is pulled from the source. To protect the auth information it is also possible to configure the jdbc-url in $NEO4J_HOME/conf/neo4j.conf under the apoc.jdbc.<alias>.url. Then instead of the full jdbc-url, you only provide the alias from the config. As JDBC in its core is mostly about sending parametrized query strings to a server and returning tabular results, many non-relational databases also provide JDBC drivers. For example, Cassandra. You can even use the Neo4j JDBC driver to connect to another Neo4j instance and retrieve data from there. It is always nice if the APIs you build have the right abstraction so that you can compose them to achieve something better. As we already covered loading from relational databases before, I won’t bore you with it again (unless you ask me to). Instead, I’ll introduce two other database integrations that we added. As many projects use MongoDB but have a hard time managing complex relationships between documents in an efficient manner, we thought it would be nice to support it out of the box. If we import the example restaurants dataset into MongoDB, we can then access the documents from Neo4j using Cypher. Added 50809 labels, created 50809 nodes, set 152245 properties, created 76077 relationships, statement executed in 14785 ms.
Elasticsearch support is provided by calling their REST API. The general operations are similar to MongoDB. After importing the example Shakespeare dataset, we can have a look at the Elasticsearch statistics. Couchbase support is upcoming with a contribution by Lorenzo Speranzoni from Larus IT, one of our Italian partners. I’m now moving that functionality to APOC one format at a time. The procedures also create a Cypher script file containing the statements to recreate your graph structure. It also creates indexes and constraints; currently only MERGE is used for nodes and relationships. It also makes sure that nodes which do not have a uniquely constrained property get an additional artificial label and property (containing their node-id) for that purpose. Both are pruned at the end of the import. Relationships are created by matching the two nodes and creating the relationship between them, optionally setting parameters. The node and relationship creation happens in batches wrapped with BEGIN and COMMIT commands. Currently, the generated code doesn’t use parameters, but that would be a future optimization. The current syntax only works for neo4j-shell and Cycli; support for cypher-shell will be added as well. The second export format I migrated is GraphML, which can then be used by other tools like yEd, Gephi, Cytoscape etc. as an import format. 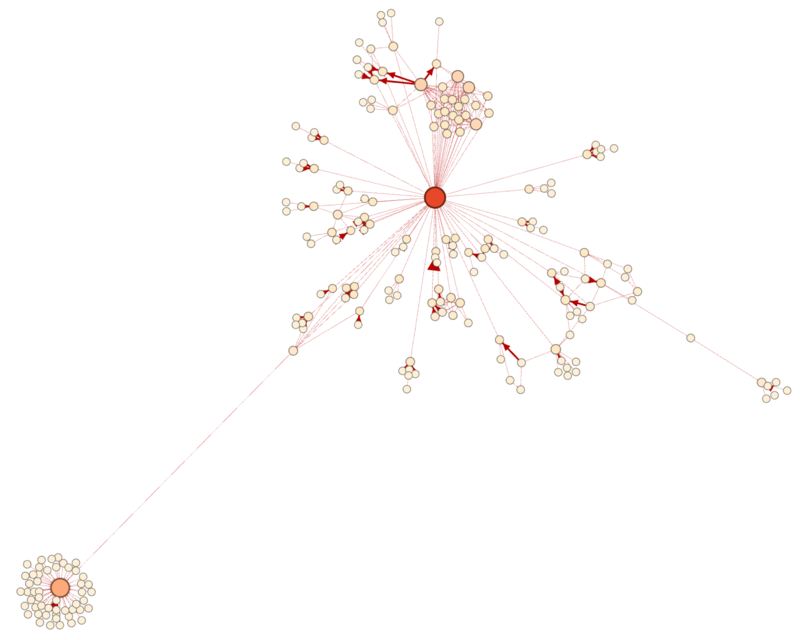 Here is an example of exporting the Panama Papers data to GraphML (after replacing the bundled with the latest version of APOC) and loading it into Gephi. The export of the full database results in a 612MB-large GraphML file. Unfortunately, Gephi struggles with rendering the full file. That’s why I’ll try again with the neighborhood of officers with a country code of “ESP” for Spain, which is much less data. I hope this article and series helps you to see how awesome user-defined procedures and APOC are. If you have any comments, feedback, bugs or ideas to report, don’t hesitate to tell us. Please either raise GitHub issues or ask in the #apoc channel on our neo4j-users Slack. Of course, you can join the growing list of contributors and submit a pull request with your suggested changes. Looking ahead to the next articles which I hope to provide all before GraphConnect on October 13th and 14th in San Francisco. If you join me there, we can chat about procedures in person. We’ll try to set up a Neo4j Developer Relations booth with Q&A sessions, live demos and more. In the next article, I’ll demonstrate the date- and number-formatting capabilities, utility functions and means to run Cypher statements in a more controlled fashion. Following will be the metadata procedures and the wide area of (manual and schema) index operations. After that, I’ll cover graph algorithms as well as custom expand and search functions. Oh, and if you like the project please make sure to star it on GitHub and tell your friends, family and grandma to do the same.